Hey everybody! Happy Tuesday! It's Spring Break week over here so with all the little ones home very little sewing will be getting done! I figured I'd take the time to share with you my upcoming projects and the fabrics I'll be using! 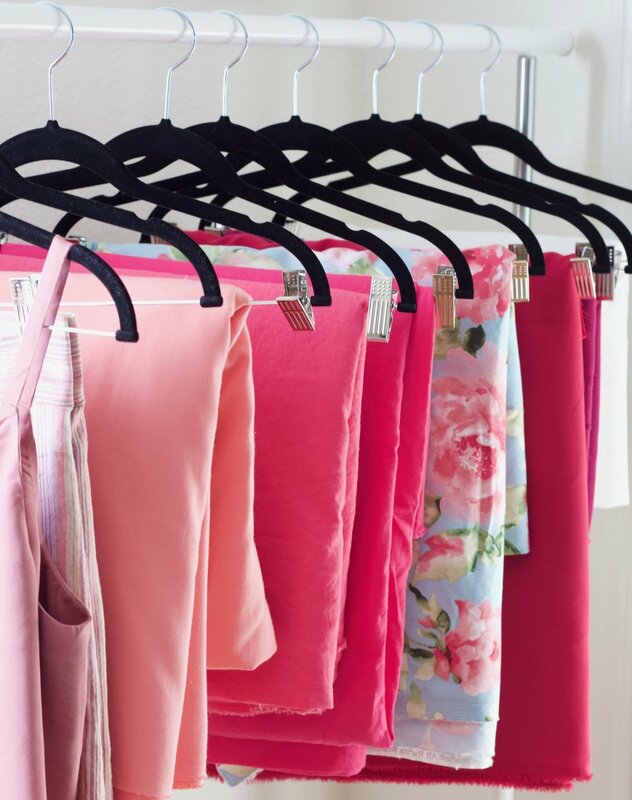 First, if you're wondering why I have so much pink, I said a couple posts back on Instagram that I think I'll start working on a "shades of pink" collection. I love creating this way! I can focus so much better when I have projects that are coordinating and pieces I know will all work together in my wardrobe! I was inspired to create collections from the talented Emily Hallman! She's truly amazing and has inspired so many including Mimi G! Now I've already finished up a couple pieces for my collection, and whats so funny is after I finished the last one, I looked at my rack of fabric and I was really overwhelmed thinking "what do make next" and "where do I start"! Thats when it hit me, that I hadn't took time to look at patterns, my closet, or the season (Dear Spring, you can come any day now!) to figure out what I wanted to make. That is KEY when creating! 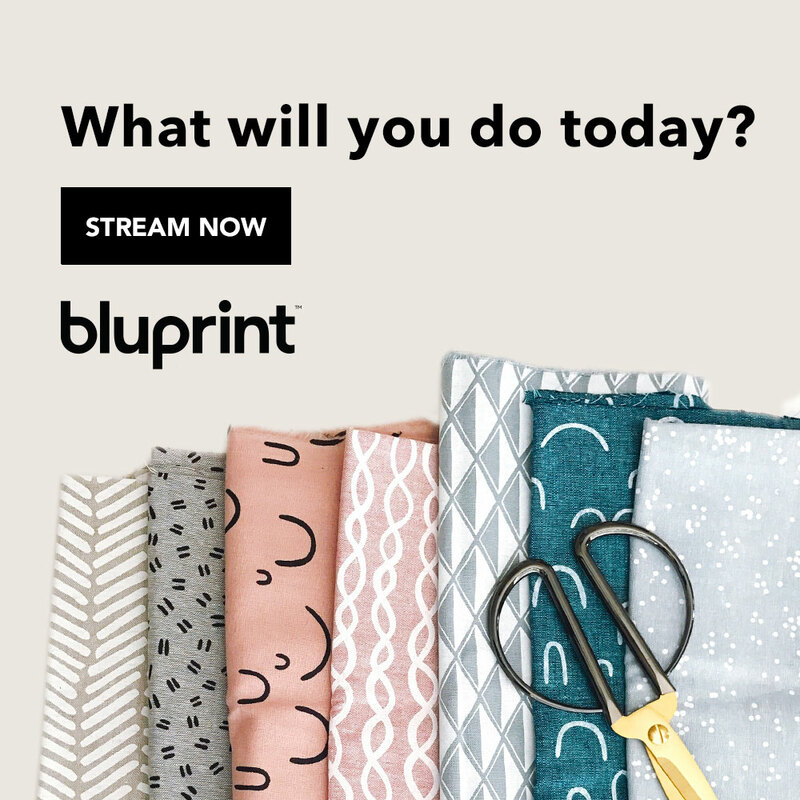 You have to know what you're making, or you will be overwhelmed looking at piles of fabrics! I loved Simplicity 8301 (couldn't find it on Simplicity site, but I found it here on Amazon) when I first saw it! Such a cute paper bag skirt and pant with option bib pattern! Unfortunately like most patterns I get, I love them but I don't always get to them immediately! But hey thats okay right, sooner or later inspiration comes along and I go on a mad woman hunt looking for it! LOL! Thats exactly what I did, when I saw Mimi make this pattern with a taper leg. As much as I love wide leg pants, I'm loving a taper leg pant a little bit more right now! For the fabric, I'm using a Salmon Twill (fabric option) that I bought from The Sewing Studio during one of their Manic Monday sales. Great quality and color! Its gonna be perfect for these pants! More LINEN! If you didn't know....Linen is one of my favorite fabrics to work with! This one is a hot pink color that I just love! For patterns, I have Simplicity 8090 and 8092 out. I'm still on the fence about these two but I wanted a cute matching set. I know that I'll be able to wear the top with jeans, the culottes with another cute shirt, and of course wear them together. I'm still deciding though....we'll see! My favorite of all these....the mommy and me look! I must say, I am so thankful to you all for the love you show me and my mini when we're in our coordinating looks! I didn't realize how much you all enjoy see that! For out next make, its wrap dresses. I'm thinking of going with View A on Simplicity 8608 for me and View B on New Look 6442 for Justice. They both have ruffles and I think its gonna be so cute! I found the Floral Cotton Sateen fabric at Hobby Lobby! Its feels nice, and I'm hoping it'll work well for our dresses! This fabric is one of my favorites also! Its a beautiful viscose crepe (fabric option) that I bought from The Fabric Store! 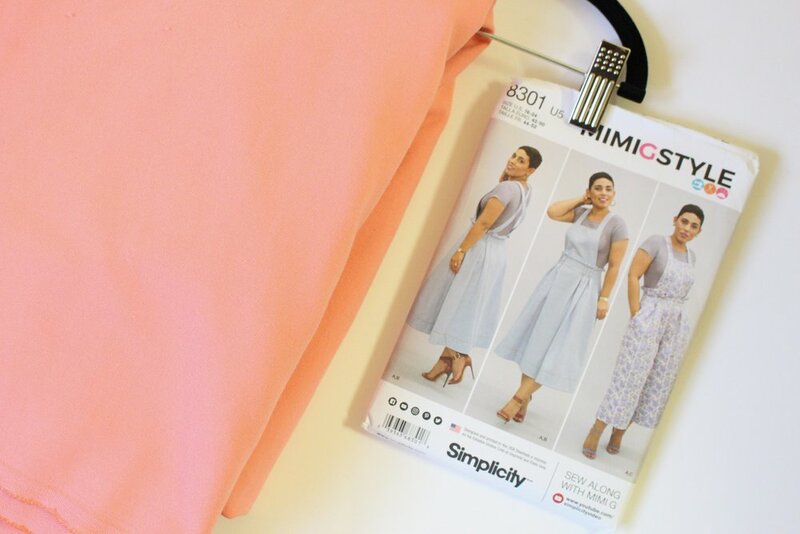 I've use this fabric before to make this dress, so I'm excited to work it to make McCalls 7725 and the top of Simplicity 8093. Again, Matching sets! I'm in love with this skirt, so I can't to get started on this! Simplicity 8554....LOVE! I've been wanting to make this for the longest! I finally have a suitable fabric for it, so I'm really excited about this project! My fabric is a gabardine (fabric option) so I'm a little nervous because the fabric recommendations are for lightweight fabrics, but hey, I'm gonna take a chance and go for it! Also, I plan to record this for a Sew With Me video, so stay tuned for that! 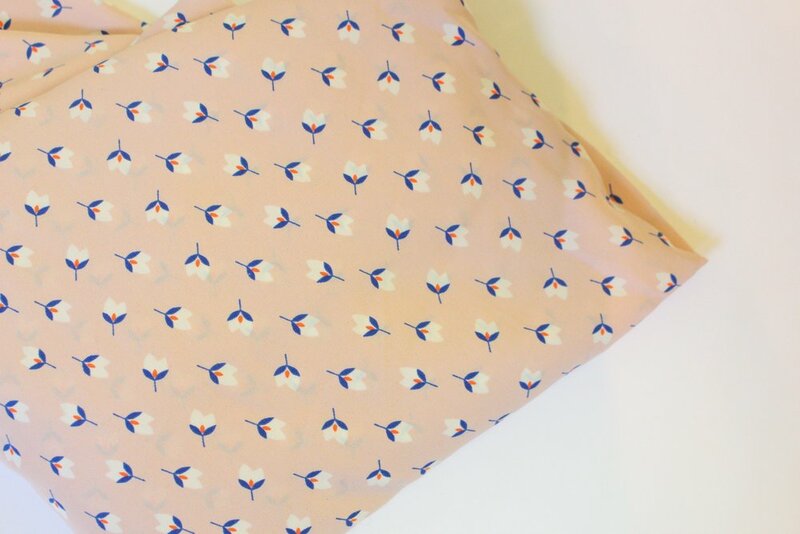 This last fabric here I found at LowPriceFabric.com (fabric option) and I plan to make an Ogden Cami with it! I recently made one and completely botched it! The fit is totally wrong, so I have to fix it! Can't let this cute little cami win, so I'll be remaking it soon! Yes, I know I have A LOT of projects lined up! I hope I can get to them all, but clearly I've lost count on how much I've planned! LOL! This will be a slow sew collection! I may not finish until July who knows! LOL! I'm excited to get to work though! I've already finished up my Simplicity 8558 Jacket and Short set, and cute pink and white off-the-shoulder top, and my first pair of white jeans!!! If you missed my first collection I created back in January, you can check that out here!